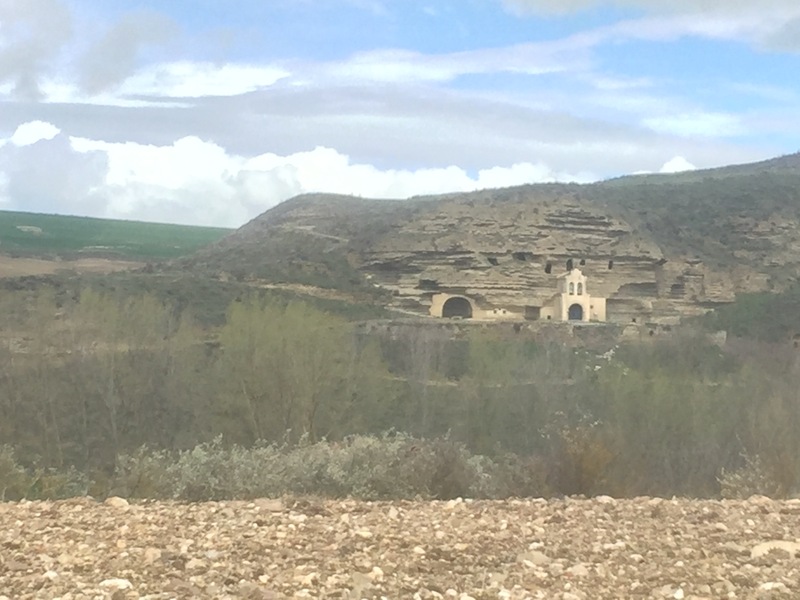 Another longish day–36km from Santo Domingo de la Calzada to Villafranca Montes de Oca. There was a very large crowd at the Albergue last night. The muddy boot room was piled high with wet, dripping shoes. This morning I had breakfast before leaving–more of that great Spanish coffee and iberica ham–so I walked out in the middle of the bubble. The path in front of me looked like first graders lining up for the lunchroom. After about an hour, things began to thin out as the landscape opened up. Crossed today into a new region, leaving La Rioja and entering Castilla, and the plains are no longer broken by forests or steep valleys. Nothing to stop the wind which was in my face all day. Rain threatened but never materialized. The architecture also shifted. The Way passes through many villages on this stretch and, while stone still predominates, there now is also a lot of exposed timber frame infilled with stuccoed brick. Between villages the Way was a wide gravel and clay path, often paralleling the main highway through the valley. I was able to see long distances ahead, the yellow path dotted with pilgrims. Although the comparison is obvious, it is hard not to see the “Walking Dead,” with a flood of pilgrims lurching toward salvation. Although they are all quite lively in the evening, pilgrims tend to walk with a dull, rocking trudge that clearly resembles the television drama (though I don’t cringe when one approaches).